Online meeting services like GoToMeeting, WebEx and others are in abundance. But they all charge you some good amount of money. $500 to $1200 depending on the package you choose but it still comes with limitations. Small teams and individuals don’t have this much money to spend on these kind of services. By being ad-supported, AnyMeeting offers its services at no cost to users, making it an ideal deal for small businesses on tight budgets. 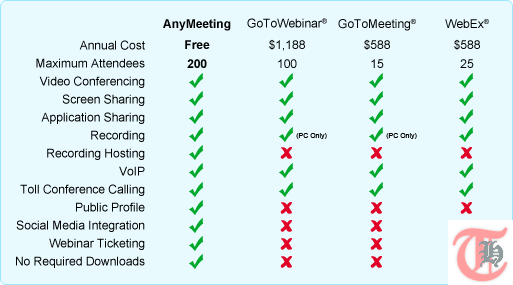 If you are looking for free alternative to WebEx, GoToMeeting and others, anymeeting is the way to go. Hosting or attending a meeting with AnyMeeting is easy. Just create an account and start the webinar or schedule it for later sometime. Anymeeting provides you with a really detailed Scheduler where you can invite attendees through their emails or you can import them from any of the previous meetings. Fill in the important meeting details and send the invitation to attendees. Conference method can also be selected upfront – chose between Computer Mic/Speaker vs. Phone. If you select phone, you will be given the conference call details upfront. Screen sharing, Application Sharing, Polling, Surveys, Chat and other communication features. Webinar ticketing – Ticket fee 10% + $1. Social Media integration. Meeting promotion through Facebook and Twitter. No plug-in to install before scheduling or attending the meeting by anyone. How to save yourself from Craigslist and other spam emails? This article has become obsolete, as this offer of AnyMeeting Free is nowhere to be found on their site, and instead one has to sign up for the Pro Service and then there is a 14-day free trial. Typical offshore marketing ploys. Thank you for the update. I will confirm and update the article accordingly. Google Hangouts is a great meeting/webinar tool it is free and packed with features, streaming, recording, whiteboard, desktop sharing and more. Also you don’t need to have a Google account to join a Google Hangout session. Hi there, I tried it and I can’t find the whiteboard and collaborating feature, any tips? Do you know if this supports those who have upgraded to windows 10? It should as it is browser based… So irrespective of the OS, it should work in your browser.